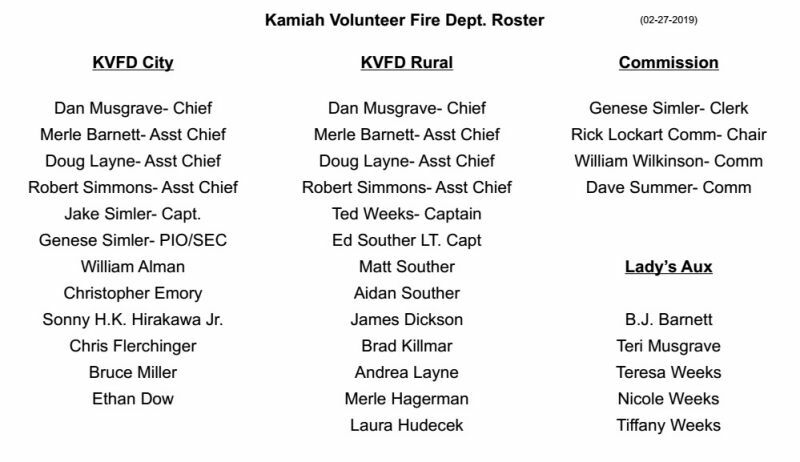 The mission of the Kamiah Volunteer Fire/EMS is to dedicate our efforts to the preservation of life, property and the environment from the effects of fires, medical emergencies, and other hazards. As volunteers we will continually strive to empower our team members with a positive, engaging and professionally challenging environment, and dedicate ourselves to the education and knowledge of the standards, infrastructure and training needed for superior service to our community as efficiently as possible. Accountability Members are accountable to each other and to the community we serve. We accept responsibility for our decisions and actions. Integrity Members are honest and fair in our dealings with our customers and each other. We represent the District and our profession with honor, and we inspire each other to demonstrate trustworthiness, openness and sincerity. Flexibility Members of the Kamiah Volunteer Fire/EMS recognize and adapt to the evolving needs of our community, and our organization. Openness Members recognize our citizens entrust us with their safety and tax dollars. In return, we conduct our business openly in monthly meetings, public hearings on the budget and other special topics, and an open strategic planning process. © 2019 City of Kamiah, ID. All rights reserved.